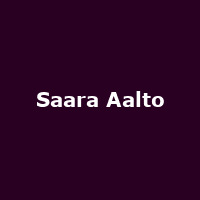 Saara Aalto is a Finnish singer, songwriter and voice actress from Oulunsalo who finished second in the first season of The Voice of Finland in 2012. havong twice competed to represent Finland in the Eurovision song contest, with the songs: "Blessed with Love" (2011) and "No Fear" (2016), she represented them in 2018 with the song, "Monsters". She competed in the 2019 edition of ITV's Dancing on Ice. She released her debut album, "Blessed With Love" in 2011, followed by: "Enkeleitä - Angels" (also 2011), "You Had My Heart", "Ai De Zhu Fu" (both 2013), "Tonight" (2015) and 2018's: "Wild Wild Wonderland".